A passionate advocate for access to arts, culture and heritage for everyone, Julie Fossitt has dedicated her career to marketing and promoting culture in Canada. After experiencing her first professional orchestra performance in Ottawa as a teen, she dedicated her high school years to music. Julie was accepted into the Bachelor of Music in Performance at the Trombone and Tuba studio at McGill University in 1995. During her time at McGill, she began teaching and became curious about community development and accessibility of the arts for all. She also joined the Canadian Forces as a Reservist, as part of the Band of the Ceremonial Guard and later as part of the Governor General Foot Guards, 5th Field Regiment Band and Princess of Wales Own Regiment, where she was both a musician and assisted with marketing and public relations for more than a decade. After she received her Bachelor of Music in Performance with Honours, she wrote her own grant application to fund a year-long placement at the Gloucester Arts Council as the Community Engagement Coordinator. Her work with local youth in community arts sparked an interest in promoting the great work of artists and she was accepted into the Income Managers Program as part of the University of Waterloo Cultural Management Program in 2000. 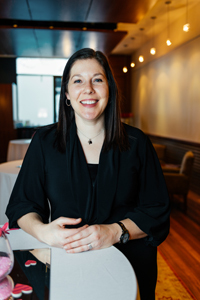 After a successful internship in the marketing department of the National Arts Centre, she was hired as a full-time marketing coordinator with the NAC Orchestra in 2001. She remained at the NAC until she accepted the position of Director of Marketing with the Victoria Symphony in Victoria, British Columbia in 2004. After years working with professional orchestras, she was seeking a more inter-disciplinary marketing challenge. She accepted the marketing position of the newly re-opened Grand Theatre in Kingston, Ontario in 2008. As the Marketing Manager, Julie not only leads staff to promote more than 50 dance, theatre, comedy, family, and music presentations annually, she works intimately with the community engagement group to promote educational programs for audiences of the Grand OnStage program. In 2015 Julie was awarded the John Hobday Award in Arts Management by the Canada Council for the Arts and in 2016 she earned her Certificate in Cultural Planning from the University of British Columbia. Julie works alongside the Grand Theatre Foundation to steward corporate sponsors to ensure a funding baseline to promote educational programming at the Grand Theatre. Under Julie’s management, the marketing group is responsible for the generation of more than $1 million in ticket sales annually and serves as a resource for cultural organizations to assist with grant applications, marketing planning, professional development, training and other advisory work. The cultural marketing team at the City of Kingston is seen as a leader in the Ontario presenting field and has consulted in many seminars, conferences and ongoing projects for Ontario Presents to assist with digital marketing planning, analytics, market research and other best practices in the rapidly changing world of marketing and customer relationship management. You can read some of Julie’s blogs here and access a series of archived digital marketing webinars for arts marketers here. Julie uses her marketing knowledge to assist local organizations in communications and PR work. Her most recent volunteer work includes the promotion of the Kingston Kids Triathlon and the launch of 100 Kids Kingston, where she built the website, manages all social media and is responsible for all media relations, marketing and communication.